There are few things I envy about other people. I mean, there are probably a ton of things I envy about other people, but if I spent my time envying what everyone else had, I would never get anything done. So, I stick to just a few things. One of them is people who do not struggle with acne. You know, if I had it for a couple of years while I was a teenager, or while I was pregnant or something, I would totally be ok with it. The fact that I have been in a full on war with acne since I was a teenager, and I am now 30, is just unacceptable. I have tried SEVERAL different products for treating my acne, and some have certainly fared better than others, but I have decided most recently that using more natural and organic products versus chemically-based ones is how I prefer to treat my skin concerns. One brand that I recently had a hand a trying is Elba Naturals, and their n.2 Anti-Acne/Anti-Blemish Treatment Gel. Elba Naturals is a truly unique company that has formulated a number of skincare products. While they have all these products in their arsenal, they introduce products, one at a time, based on what their customers want. They claim to cater to the "green urban lifestyle" with natural skincare products made from quality ingredients. They currently offer 5 products, although I suspect that they will be launching a 6th soon, as there is a live countdown currently on their website, claiming to reveal "a surprise". When ordering products from Elba Naturals, you know you are receiving products with mostly natural and organic ingredients in them. On top of that, their products are made in the USA and are done so with cruelty-free practices. The Elba Naturals n.2 Anti-Acne/Anti-Blemish Treatment Gel can be used, from my understanding, two different ways. On the bottle it says to apply a small amount to a moistened face, rub in circular motions for a minute or two, rinse off and then follow up with toner and moisturizer. On Amazon, the directions in one of the product images says to use it after your moisturizer by dotting it on your forehead, cheeks and chin, and then rubbing in outward, then down. Because I like to follow the directions on the bottle, I did it the first way. I wash my face as usual, and then slightly dry it off, use a couple bumps of the Elba Naturals n.2 Anti-Acne/Anti-Blemish Treatment Gel, rub it around for a minute, and then rinse it off. If your face is too wet, it kind of just feels like you are pushing the water around your face, and if you dry your face too much, the product completely absorbs into your skin (which I would think would be the point, so it can treat the acne - I mean, what is the point of washing it off?). I'm not sure what the "right" way is to use it, as it seems more like a second cleanser than a spot treatment, since you have to wash it off. The serum itself is gel-like, and the smell reminds of Christmas (likely from the Clove Oil in it). Speaking of ingredients, some of the active ingredients in this treatment are: Witch Hazel, Salcylic Acid, Arginine, Aloe Vera and Collodial Silver (just to name a few). After using it for a few weeks, I can say that it does make my skin feel smooth, and has really helped with my painful cystic, hormonal acne breakouts so much that I haven't had any. I love that the ingredients are 98% natural and 72% organic, that the products are made here in the USA, and that they also are cruelty-free. It never ceases to amaze me when natural products work just as well or better than those over-the-counter products that are filled with chemicals that are actually harmful once absorbed into the body. If you are looking for an all-natural acne treatment, or know someone who is, you can purchase a 1 oz pump bottle on Amazon for $35. A little pricey for the size, but you do get a 180 day money back guarantee if you are displeased with the products performance. I am a die-hard candle lover. What does that mean? I love candles... A LOT! Like a lot, a lot. As in, I have a gigantic drawer in my dresser dedicated totally to all things that smell good. That also means that I am very picky when it comes to the items I use to fragrance my home. I do not tend to buy candles or home fragrances from just any store, instead, I prefer to buy candles from specialty stores such as Yankee Candle and Bath and Body Works. They offer a variety of scents, their candles burn for a very long time, and most importantly, their scents are pleasant, enjoyable, and fill a large area of the home. I am always excited to try candles because I use them so often that my collection can always stand to be added to. I recently tried Scentiments Soy Scented Candles, and am here today to talk about my experience with them. Scentiments are unique because they offer a bit of a personal touch. The label on each candle can read one of 4 things: "Happy Birthday", "Family", "A Friend" or "Sister". These make them especially nice to give as gifts. They have a chic-country style to them, and come in four different fragrances: Vanilla, Cinnamon, Lavender or Cool Cotton. Each candle is made with high-quality soy and fragranced with essential oils. This gives you a special combination the ensures an even, clean burn, and a scent that spreads around the house without being overwhelming. They are also packaged in re-usable Mason jars, which are great for crafters, or anyone who could use a handy jar around the house. And lastly, they come with a miniature card around the rim of the candle where you can leave a note if you are gifting the item, or simple remove if it is for yourself. I really have enjoyed my candle thus far. 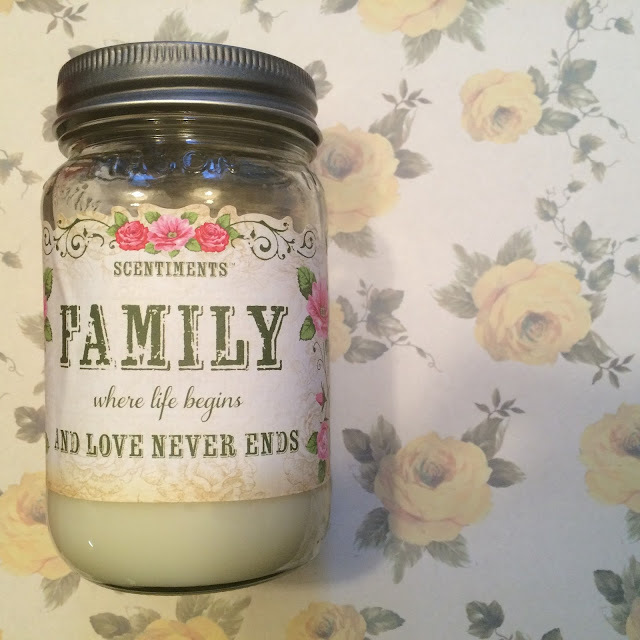 I chose to get the Cool Linen scent with the jar that reads: "Family: Where life begins and love never ends." It's very appropriate for myself. At this point, I have burned the candle for SEVERAL hours. As you can see, I never even snapped a pic before I used it. It was filled to the bottom of the rim with wax, and the wick was nice and white at first. I have to say that this does burn slowly and evenly, which certainly elongates the life of the candle. I have experienced so many cheaper candles that burn through the center only, leaving wax all around that is wasted. I enjoy the ease of candles, as you simply light them and reap the benefits of doing so. The scent is very crisp and clean, and reminds me of laundry soap and sunshine. It's really a great Springtime scent, but it's also very neutral since most people really love the fresh, clean scent of soap. I am interested in trying the other scents too, and think that the Vanilla and Cinnamon would be ideal for this time of year. Plus, they would make great and thoughtful gifts. If you are interested in purchasing one for yourself, or someone you know, they are available on Amazon for only $15.97. An excellent price for such a quality product. How many times per day or week do you use plastic wrap, aluminum foil, cling wrap, etc. over food to keep it fresh longer? Or how many times do you cut open fresh fruit or vegetables, and wish that there was a way to preserve what you don't want to use without having to cut it up or use it all at one time? Or how many times have you lost the lid to your food storage containers? The Silicone Storage Lids are the answer to these common problems. They come in a set of 6 lids of varying sizes. Now, because they are made out of silicone, they are very easy to stretch over just about anything. Have a drink you poured but don't feel like finishing? Take the smallest one and stretch it over the top and pop it in the fridge. Want to eat a fresh watermelon but don't feel like cutting up the entire thing? Cut the melon in half and stretch the largest sized one over the opened part of the melon. That way, until you are ready to eat it, or cut the rest of it up, it is kept fresh. If you couldn't tell, I LOVE these things. The second I got them I took every opportunity to tell everyone I knew about them because I feel like they are so unique, yet so helpful around the kitchen. I have found that they work best when you use the size that is a tad smaller than the object you are trying to cover, where you have to stretch it to cover. It gives it a nice sealed cover. These are completely versatile too because aside from covering a range of sizes, they can also cover an array of shapes, not just things with a circular shape. They are very easy to clean too. I use warm soapy water and a sponge to get them clean and then leave the to dry in the dish rack. When storing, I simply nest them, with the largest on the bottom and the smallest in the center. It takes up very little room in my cupboard, and they are still easily accessible. Most importantly, they are reusable, and eliminate the need to waste other products that can be used only once or twice. If you are looking to purchase these, or even buy them as a gift for a friend or family member, you can find them on Amazon where they are only $13.74 for the set of 6 I received. Excellent price if you ask me! So oils are a big thing right now. I mean, they've been around for a LONG time, but for some reason crowds of people have picked up on their usefulness and are using them for everything! I have dabbled in oils just a little bit. I am certainly intrigued and want to get into it, but with everything, there is a price, and as a stay-at-home mom, that price is often not affordable. I love that I have been given the opportunity to try a few oils for the purpose of reviews, and I have enjoyed my experience enough to truly think about investing more seriously in oils. I just appreciate how versatile and all-encompassing they are. I recently received a large bottle of Oleavine Neem Oil, and this is one of those "cure all" oils. Neem Oil comes from the Neem tree which is native to India, where it is referred to as the "Divine Tree". Most often, Neem Oil is used in hair and skincare products, although it also makes a decent pest control. It has a very distinct earthy scent, which makes it optimal to mix with other essential oils to create a more pleasing scent. That way, you reap the benefits of the Neem Oil, while masking the scent. Oleavine uses unrefined and solvent-free Neem Oil that they cold press. Essentially, that is the least destructive way to get the oil from the nuts. On top of that Oleavine uses no synthetic fragrances, preservatives, parabens, petroleum, phthalates, sulfates gluten, and they do not test on animals. The only ingredient on the bottle is: Neem Oil. It is very rare that you find a cosmetic product that has so few ingredients. I have never used Neem Oil before, so I had no idea what to expect. I figured it would have a pungent scent such as Tea Tree Oil, which I have really grown accustomed to over time. This is not the case for this. It has a nutty, earthy scent that truly takes some getting used to. Instead of using this for my skincare needs, I have chosen to add small amounts to my conditioner to aid in my hair care routine, and will be also using this as pest control as the stink bug population is OUT OF CONTROL this year. I found 3 of them in my clothes just yesterday - Gross! We also are going to start a garden in the Spring, so I am going to save (or buy more) of this to keep the pest away without compromising the integrity of our vegetation. I have heard wonderful reviews regarding it's ability to keep plants free of bugs, so I have high hopes. As far as adding this to my hair care routine, I have found my hair to be much shinier and more manageable since doing so. Sometimes my hair can get a little frizzy and this really helps to give my hair a straight, sleek, shiny look. If you are interested in purchasing your own, you can buy a very large bottle of it (12 oz) for only $15.95 on Amazon. It's beginning to look a lot like..... dry skin season. Each year as the weather gets cooler, my skin, and the kids skin gets drier and drier. With the heat on and the hand-washing at an all time high, it is no wonder that our skin gets a little drier this time of year. What I don't do is g to the store searching for the latest and greatest from the big brands out there. I am a little pickier when it comes to what I will put on my skin, and even pickier about what I will put on my children's skin. Unfortunately, several common brands make products that contain ingredients I would not feel comfortable putting on my children, so I research and seek out brands that use more naturally-derived and organic products. One such brand is Mom of 11 Kids™. Mom of 11 Kids™ is a brand that offers several different skincare products for the entire family that are made from all natural ingredients. They were created by, you guess it, a mom of 11 kids, named Tami. She married young and had 4 children. She later divorced and then married a man with 7 children. Together, with their 11 children, they have lived and learned what products, ingredients, etc. work, and are worth having around. 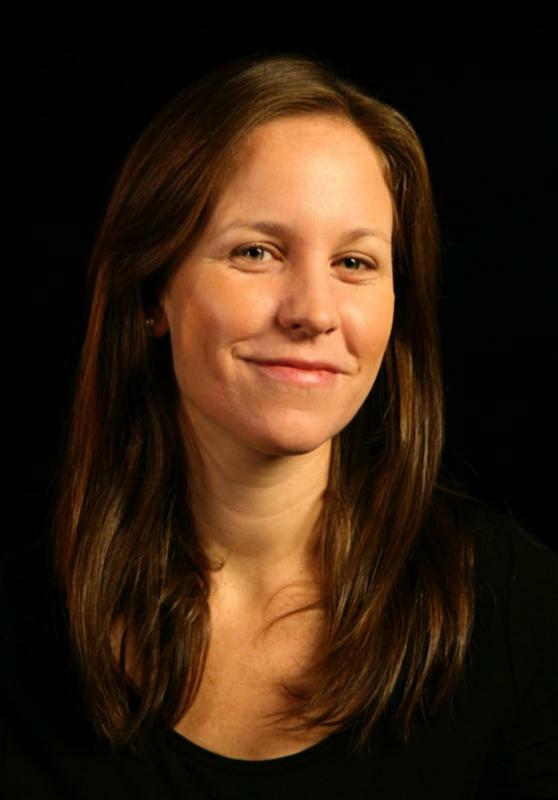 Tami developed her line of products to be helpful to families who need products that work, and that they can fit into the budget. Many middle class families do not have money to waste on the big claims of many companies. Each of the products are free from alcohol, artificial dyes, artificial fragrances, parabens, steroids and phthalates, and they are formulated to be safe and gentle to use on even the most sensitive skin. I am really looking forward to putting this stuff to good use once the cooler weather hits here in New York. I have used a small amount of it so that I could accurately provide my thoughts and opinions, however, I am saving the majority of it for when I will need it most, in likely just a few short weeks. This product has the consistency of coconut oil, where it is solid at room temperature and malleable when warmed to body temperature. I typically swirl my finger around the top and I get the product out that way. A little really goes a long way, and fortunately it does absorb rather quickly. Sometimes natural products created from the mixture of several oils and butters are very greasy and take a long time to absorb. That is not the case with this product. I really love the adorable tin that they come in too. It is easy to open, the packaging looks nice, and it would be cute to re-use after the product is gone. My only complaint is that there is no scent. I get the point of it, but I like natural scents for my natural products, even something like lavender for it's calming effect. If you are interested in purchasing this product, or discovering their entire line of products, feel free to explore their website, or find them on Amazon. I received a 5.9oz jar which retails for $22.75. Disclosure: The book mentioned below was provided complimentary for the purpose of an honest, unbiased review. The experiences detailed below are entirely my own. There are several "labels" that our kids are not born with. 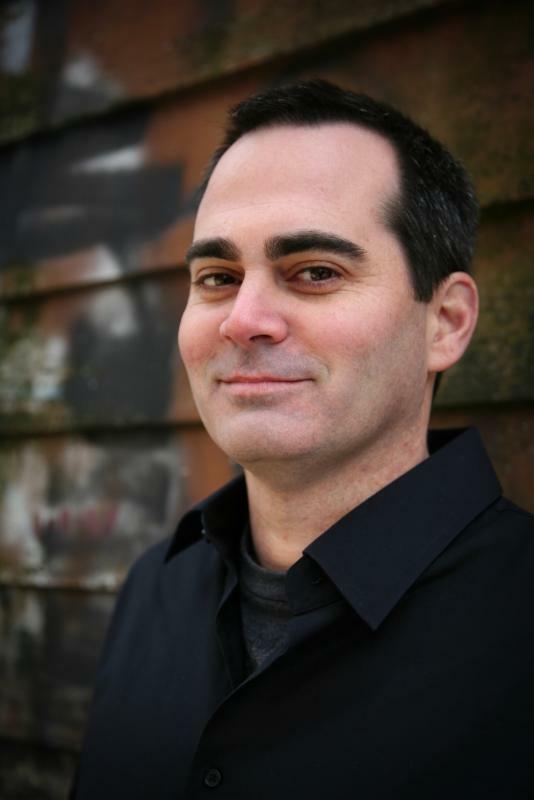 Before you have children, and if you crave them desperately enough, you only consider the multitude of amazing things that come from being a parent. It is only after you have taken on that role that you begin to grasp the reality of the not-so-easy things about parenting. For example, the first time your child gets hurt really bad, the first time their friend betrays them, their first break-up, etc... In other words, the first time your heart breaks so intensely for another person it physically hurts you, and there is nothing you can do about it besides stand by their side and support them. Another similar subject is having "the talks". You know what I mean, and they are neither easy nor predictable. What helps, in some instances, is preparing your children, and one of the easiest ways to do this is through the use of books. Especially when they are young. 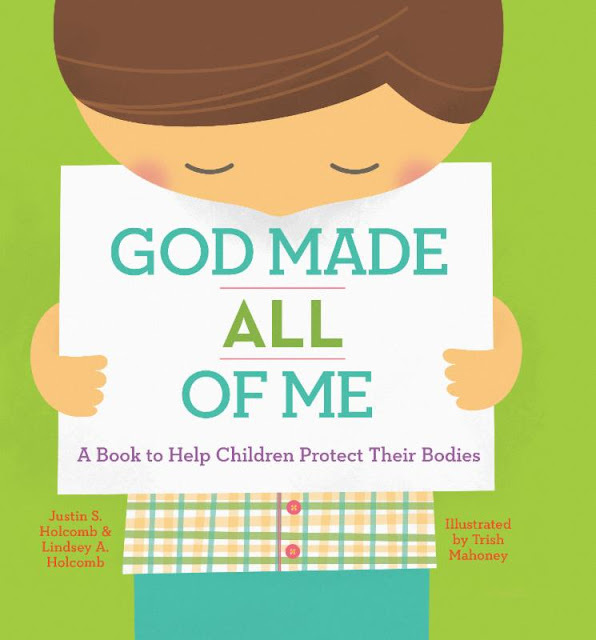 We recently had the opportunity to review "God Made All Of Me" by Justin and Lindsey Holcomb. This is a children's story that addresses the very sensitive topic of: our bodies. While we hope to never encounter a situation where our children are violated, the fact of the matter is that prevention and awareness is key. Children are very trusting of adults because they are brought up to abide by what they say, to respect their elders. There are times when this backfires, and children are taken advantage of for their innocence and trusting nature. God Made All of Me" explains to children, in age appropriate language, that their bodies are good because God made them. Furthermore, they explore body parts that are for sharing, and those that are not. They also address those times when kids prefer not to be touched, and the concept of secrets, safe people and what to do if they are ever made to feel uncomfortable. I have been reading this book to my 3 year old, and love that it does several things for us. First, in opens up our lines of communication. She is at an age where she is comfortable talking to me about her "private" parts. Eventually, there will be a time when she is less willing to do so, and the fact that we are taking some of the stigma away from it now should aide in that. Second, this book not only addresses the subject but gives children an example of what to do. There is a page in the book where you can actually write down people who make your children feel safe and strong, so they have a working list of people they can turn to when needed. This is HUGE, because there are several times when children are abused and taken advantage of where they turn to adults and the adults do not listen or do not believe them. And last, but certainly not least, this book does not shame children and their bodies. Instead, it teaches them that our bodies are made by God, and they are good, from the tip of their nose, to their tiny little toes! You can purchase your copy of "God Made All of Me" HERE, and don't forget to hear what other Litfuse Reviewers had to say HERE.